The Tatamia is Peg Perego’s newest luxury highchair. Introduced earlier this year, this multifunctional seat does triple duty as a swing, highchair and a recliner. Installation – Out of the box the Tatamia was ready to go. No installation needed, just unfold and go! Getting started – The design of this chair is genius. When folded, it measures just 14 inches wide, making it a good choice for parents who are short on space. 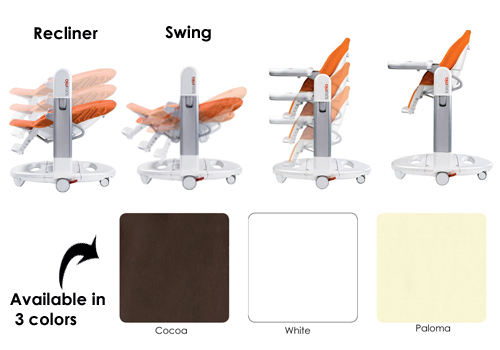 Once opened, the Tatamia is a full size feature rich chair that will accommodate a baby from newborn to toddler. At first, I was a little overwhelmed by all of the steps needed to fold and unfold the chair, but the whole process quickly became second nature after I did it a few times. For ease of use, Peg Perego has labelled all of the levers needed to convert the chair in red. 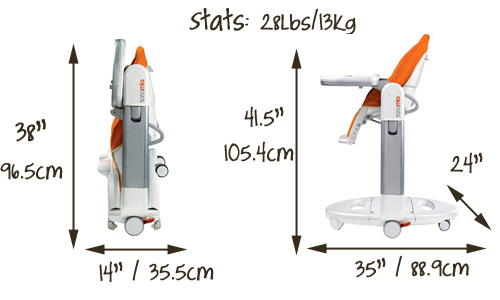 Features – For newborns, the Tatamia is a safe, easy place to lay the baby when you are making dinner or getting stuff done around the house. As a swing, I use it to soothe my son while I watch TV or feed my oldest son. Rather than being battery operated, the Tatamia’s swing is manual so that you can interact with your baby, while keeping them entertained. In highchair mode, parents have 9 height positions for comfortable feeding. I like this because I can roll him up our island to eat or adjust it down for the kitchen table. If I’m sitting at the kiddie table feeding my oldest, I can drop it right down so that my youngest is at the same level as us. This is helpful when I’m feeding them both at the same time. For the seat, Peg Perego uses a ‘leatherette’ that looks extremely close to the real thing. At first, feeding my son in such a luxe chair freaked me out a bit. I didn’t want to wreck it. After just a few messy meals, I learned that not much can damage this seat. The only downfall I have found is that the leatherette is not machine washable and the waist strap doesn’t come off at all for washing. In the near future I plan to purchase the Tatamia Accessory Kit($80), which comes with a seat cover that is handwashable in cold water with mild detergent, a Ventilate Hood and a toy-filled Play Bar. This will give me piece of mind now that my son is getting to the stage where he wants to feed himself and cover everything in food in the process. The Tatamia’s feeding tray is both spacious and easy to clean. 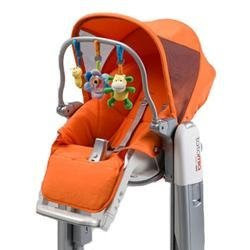 It can be positioned two ways, the first with a lever on the front that moves it back and forth and secondly with two levers underneath the chair to get it closer to your child. Storage – One of my favorite features of this chair is the fold. In just seconds, this full size highchair can be folded down to be small enough to fit in a corner or closet. Because our house is not huge, this is nice for us when we are having people over. The Tatamia‘s ability to function as 3 pieces of baby gear makes it a good choice for parents who do want to clutter their house with ‘stuff’ that your baby will only use for a short time. I highly recommend this highchair to anyone looking for a chair that will grow with your family. Both my boys use it at different times. My 10-month-old to eat in, my 4-year-old to watch tv and do crafts at the big table. Thanks for the thorough review! After reading this, I decided to go ahead and buy this highchair (fyi, I found a really good deal on it and free shipping on a website called myregistry.com). I’ve been looking for a chair that “grows” with the baby, and I like the way this one looks also. Hi there, just wondering how far it is between the back of the seat and the tray when it’s pushed in as far is it goes? 8.5 inches from the back of the seat to the front of the tray.